We're so glad that you're interested in us. On this page we will introduce our company, our culture, and our leadership. Want to know more? Give us a call anytime! In 2013, Andrew Bergen saw a need to help logistics companies find qualified talent quickly. He recognized the dilemma that so many organizations face: finding well-qualified talent that also fit in with the company culture is incredibly time-consuming. But without spending the time to carefully source, qualify, background-check, and train, employee turnover can be very high. Spectra360 has created a better method. Andrew’s experience led him to start Spectra360, a talent management company primarily for logistics companies. Spectra360 offers customized employment options to suit their clients, whether contract, temp to hire, direct hire, or even talent management solutions. By consistently working within the logistics industry, we are able to source qualified candidates quickly and build a pipeline of potential employees that would fit into your team at a moment’s notice. Since 2013, Spectra360 has developed a reputation for excellent service. In 2018, Spectra360 was named amongst the nation’s fastest-growing talent management agencies by Inc. Magazine. We have also been recognized as the 13th largest staffing firm in San Francisco and one of the fastest-growing companies in that region. We now serve clients nationwide and continue to grow thanks to the hard work and diligence of each employee. To learn more about Andrew, click his profile image for a full biography. To learn more about Christina, click her profile image for a full biography. To learn more about Michael, click his profile image for a full biography. To learn more about Mark, click his profile image for a full biography. To learn more about Jennifer, click her profile image for a full biography. To learn more about Kim, click her profile image for a full biography. Andrew is the President and CEO of Spectra360. His past success in developing high performing sales teams and his passion for entrepreneurship brought him to start Spectra360 back in 2013. Andrew has spent nearly a decade in senior level sales and management roles and has extensive experience opening and building new markets. He brings a high level of passion and strategy to the human capital and talent management sectors. When not in the office Andrew enjoys golfing, traveling abroad and visiting the Northern California wine country. Click here to visit Andrew on LinkedIn. Click here to visit Spectra360 on Facebook. Click here to visit Spectra360 on Instagram. Click here to visit Spectra360 on Twitter. Michael Bedard is the Financial Controller at Spectra360. He is a former Big 4 Auditor with a Canadian Chartered Accounting designation (U.S. CPA equivalent) with a broad knowledge of all aspects of a company. After earning his CPA, Michael became the Director of Finance for a Fortune 500 company. He has since transferred his extensive knowledge to several start-ups, working on acquisitions, financial assessments, and planning. His expertise aided in the growth of multiple companies prior to joining Spectra360. Michael joined Spectra360 in 2017 and immediately improved the accounting processes by quickly implementing a 2018 budget and installing new reporting for internal and external processes. Jennifer Lacap (Jen) is the Director of Client Acquisition for California and Arizona. Her area of expertise is coaching, mentoring, and assisting in sales and recruitment efforts. With over a decade of recruiting and sales experience, Jen is well known for creating long-term partnerships with clients thanks to her ability to personalize each hiring experience. Jen attended Foothill Community College, San Francisco State University, and Anthony Real Estate School. She enjoys giving back through the Spectra360 partnership with Operation Gratitude, but in her downtime, you can find her watching movies and spending quality time with her husband and three kids. Visit Jen on LinkedIn by clicking here. Kim Westerberg, CSP is the Director of Client Acquisition in Southern California and Arizona for Spectra360. She is a proven and respected leader with 20+ years of experience in the staffing industry focusing on operations and building long-lasting business partnerships. Prior to joining Spectra360, Kim was a Market Manager for nearly 16 years with Staffmark. She is active with her daughter in the National Charity League by giving back to the community by volunteering at different non-profit organizations, such as the Ronald McDonald House, Childhood Cancer Foundation and Santa Claus, Inc.
Kim has a proven track record of meeting and exceeding financial goals, customer expectations, and nurturing the culture of high-performance organizations. Visit Kim on LinkedIn by clicking here. Mark A. Nelson joined Spectra360 in 2017 as the Vice President responsible for opening the Greater Chicago market. Mark has over 20 years of experience within the human capital management arena. Previously, he owned one of the fastest-growing commercial staffing companies in the United States before successfully negotiating an asset-based purchase with a publicly-traded company. Mark also engineered expansion efforts into the Central United States for Atrium Staffing as its Market President. He previously served as an Executive Vice President for Westaff, where he was responsible for overseeing a $100M+ region that included 52 branches and 100 internal employees. Mark has an extensive professional background in territory expansion, business development on a national scale, finance, operations, and leadership development. He has demonstrated consistent results in high growth, acquisitive, and turnaround environments. Click here to visit Mark on LinkedIn. Christina Welcome-Lopez is the Vice President of Talent Acquisition of Spectra360. She is a seasoned leader with a successful track record with professional talent acquisition, freelance placement, client relations, and management. With expertise as both a Manager and an Individual Contributor, she has been able to hire, train, and grow respected recruiting teams that have become experts within their industry verticals. Christina has a diversified background recruiting professionals across creative, marketing, and technology for Fortune 100 and 500 companies, primarily in the San Francisco Bay Area. She is obsessed with providing her clients with outstanding customer service, while delivering value and quality that is second to none. When not in the office, Christina spends her time hiking with her German Shepherd dogs, riding her peloton bike, and enjoying the Sonoma wine country. Click here to visit Christina on LinkedIn. Passion. Adaptability. Teamwork. Integrity. Efficiency. These are the values we cherish. By sourcing the right PEOPLE to fit the needs of our clients. By building a CULTURE that makes employees proud of their career. By building the CONNECTIONS to push our business, our employees, and the business of our clients to the pinnacle of their ability. Spectra360 has been recognized in the media once again. 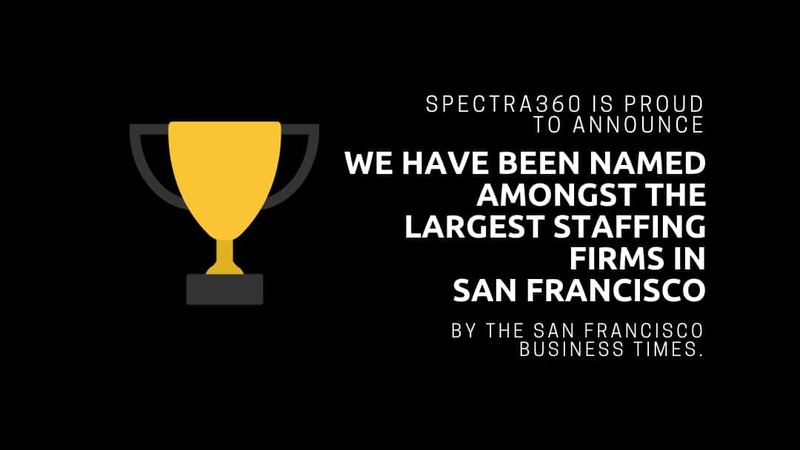 This time, Spectra360 has been recognized by the San Francisco Business Times as one of the Largest Staffing Firms in the Bay Area.